Notable line: When asked by a reporter if "the buck stops with you over this shutdown," Trump replied with a twist on the classic sentiment once put forth by Harry Truman. "The buck stops with everybody," said Trump, per the Week. 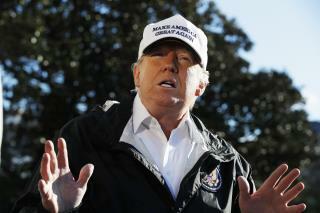 Competing messages: Trump on Thursday quoted Steve Doocy of Fox and Friends saying that the president's supporters don't want him to cave on the border wall issue. "I won't!" wrote Trump. Co-host Brian Kilmeade, however, said that an emergency declaration "would be a disaster in the big picture" and would set a "terrible precedent," per the Hill. Kilmeade raised the possibility of a future Democratic president declaring an emergency over climate change. There has been NO 'wall' along the US southern border for over 235 years. NOW - the Orange Blob claims the lack of a wall is a pressing national security issue and the American empire will quickly fall if the brown women carrying their babies are not stopped at the border with a giant thick concrete wall. Pah-leeze. The Orange Blob has painted himself into a corner by completely inventing this border wall crisis to simply feed his dwindling base of groupies. The BEST path forward now for the Orange Blob is to declare a national emergency for the wall and open the government - then the courts will quickly decide the southern border problems are NOT a national emergency. The Orange Blob could then tell his brain washed orange groupies that he did all he could do to get the wall built - but the damn democrats prevented the wall from being built. The Orange Blob could save face and get the government to re-open. The REAL national emergency in the USA is opioid addiction and death. Over 100 Americans die EVERY day from opioid overdoses, and these opioid pills are made in America and are prescribed by American doctors. The Orange Blob needs to rethink his definitions of what constitutes a national emergency in the USA. "The buck stops with everybody" - An actual moron If you run your organizations like that no wonder they went bankrupt so many times.